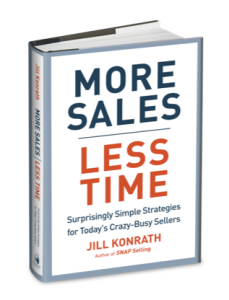 Jill Konrath has written 3 best-selling books on sales, and now she’s out with a new book on personal productivity called More Sales in Less Time, Surprisingly simple strategies for today’s crazy-busy sellers. 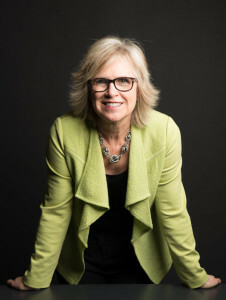 As Jill mentions, she didn’t write this book because she started as an expert in this, but “to save my life”, because even Jill Konrath has challenges with getting things done and handling the constant interruptions of modern life. The completely accidental way she got into sales (this is becoming a pattern, right?). Why sales was a great fit for her, against all her preconceived notions. Why she started her own company. How she got overwhelmed with the very technology that was supposed to help her. How family emergencies forced Jill to prioritize even more ruthlessly (crossing of the “nice to do’s”, and “like to do’s” and focus on the “have to do’s”. (And why having a “don’t do” list is as important as having a “to do” list. How Jill used to use her calendar, and how she changed to be more effective with her time. The practical suggestion from Jill’s book that Reuben put into place the next week. RescueTime— gives you analytics on how you’re spending your time on your computer. Freedom.to— block websites that can drain your time. I switched to cab for this one– a very nice 2013 Franciscan Estate Napa Valley cab which was quite good and made me think I need to get back to cabernet sauvignon more often. Jill enjoyed “something white from the fridge.” 😉 She said she’s not used to having wine while being interviewed.